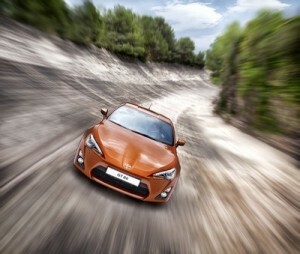 The Toyota GT 86, the world’s most compact sports car, is being launched at the Tokyo Motor Show next week. Building on Toyota’s heritage as a manufacturer of much-loved, high-performing sports cars, the design combines power under the bonnet with an expressive, aerodynamic body. The Toyota GT 86 is currently the only car in the world to have a front-mounted horizontally opposed petrol engine and rear wheel drive. The compact flat-four boxer engine with D-4S injection technology was developed as part of the collaboration between Toyota and Subaru. The result of their mutual desire to create a new world-leading sports car is an engine that delivers a lively, engaging performance for those who want power and torque at different speeds, without sacrificing fuel efficiency or environmental considerations. The powertrain reacts instantly to subtle changes in throttle and steering. The Toyota GT 86 is designed to give dynamic stability even at the limit of the car’s performance, while maintaining the purity of the driving experience. This is made possible by the inclusion of an ABS system and switchable vehicle control systems that are specifically tuned to the demands of a sports car. Transmitting power to the rear wheels by a limited slip differential delivers optimal grip across all driving conditions. The dimensions of the car gives superior balance, as well as being exceptionally compact. An ultra-low centre of gravity and a light curb weight provide nimble handling and outstanding cornering poise, perfect for brisk, sporty driving. Inspired by motorsport technology, the clear, evocative exterior is a combination of new design language with the technical needs of providing compact dimensions, sportive aerodynamics and a low centre of gravity. Attention focuses on the lower part of the car, with its powerful “scorpion-look” grille. Other sporting elements include 17-inch alloy wheels, twin exhausts and a rear spoiler. The buckskin trimmed steering wheel, which at 365mm in diameter is the smallest ever on a Toyota, is a direct result of Toyota’s desire to make driving the GT 86 instinctive and intimate. They adapted design features after collecting extensive feedback from test drivers on how to give the best steering performance and grip. The Toyota GT 86 is an extension of Toyota’s 50-years sports car heritage, particularly of producing successfully competitive front-engine, rear-wheel drive sports cars. The GT 86 is inspired by the popular Toyota Corolla GT AE86, a must-have for rallying and circuit driving its production lifetime of 1983-1987. The car won an enduring reputation, as well as two British Touring Car Championships titles and a string of top-level rally triumphs. For drivers keen to experience the unfettered joy and power of the Toyota GT 86, it will be available to buy in the UK from June 2012. To order your new Toyota GT 86 contact our sales team. Alternatively, visit our website where you will find new and used Toyota’s available for sale or on finance. If you want to keep up-to-date with news and launches from the Tokyo Motor Show, like us on facebook or follow us on twitter.